Housebreaking your new Miniature Schnauzer puppy will be a breeze if you follow the steps below. And if you have chosen to crate train your puppy, you are already well on your way. Our puppy potty training method works fast but you must do your part. If your dog has an accident, it's because you weren't paying attention to the warning signs or waited too long to let him out. But if you do it all right, you can have your new puppy or dog housebroken fast in about 2 weeks! And be sure to read our secret potty training tip below. It really helps puppies learn to potty in the right spot. • STEP ONE - Choose Potty Spot and Potty Command: The first step of the process is to decide WHERE you want your puppy to eliminate and to choose a command to encourage him to do so. The spot you choose will become your puppy's permanent potty area. When you take your Miniature Schnauzer outside to go potty, always use the same exit door, the same potty spot, and the same potty command. • STEP TWO - Housebreaking Schedule: Create a regular potty schedule for your puppy that fits into your daily routine. If you are not using a dog crate, you might want to section off an area in your home to keep your puppy and confine accidents. (See: How to house train puppy using the paper method below). Puppies are not able to hold it for very long, so in the beginning, take your puppy outside every hour to relieve himself. This will help prevent in-home accidents. Remember to praise your puppy each and every time he relieves himself in the potty spot. • STEP THREE - Create a Feeding Schedule: Feed your puppy 2 to 3 times a day at the same time. Scheduled meal times are good indicators of when your puppy will need to go out. Most puppies need to relieve themselves immediately after eating or within 30 minutes of a meal. • STEP FOUR - Watch Your Dog: During those times of the day you allow your puppy to run loose in your home, it will be your responsibility to monitor him closely. Don't forget, your Miniature Schnauzer is in the learning stages of house training and you cannot expect him to just know what to do. You have to teach him. So watch for the common signs of pre-urination like: sniffing and circling in a particular spot, or suddenly disappearing out-of-sight. As soon as you see any pre-urinating behaviors, reprimand quickly with a loud firm NO and immediately pick him up and take him outside to his potty spot. Use your potty command, and praise your Schnauzer for eliminating outside. • STEP FIVE - Repetition and Consistency is Key: During the housebreaking process, it is important that you remain consistent with your training. Be sure to take your puppy outside often and most importantly: after every meal, when he wakes from his naps, and after a few hours of indoor play. Always use the potty command and be sure to praise your Miniature Schnauzer puppy when he finishes! 1. Never reprimand your Miniature Schnauzer puppy after the fact. Your puppy will not understand or be able to associate the reprimand with the act of urinating. And rubbing your puppy's nose in urine soaked carpet does not work either. In fact these methods could cause your puppy to fear you... and you don't want that to happen. Only if you catch him "in the act" should you use a firm verbal NO and quickly take him outside to finish. 2. Monitor your dog closely to prevent potty accidents from happening in the first place. This means take your puppy outside often. Remember, puppies can't hold it for very long. If you will be home with your puppy take her outside for a potty break every hour. And... don't leave your puppy to roam around the house unsupervised. If your puppy has an accident indoors, you need to figure out where you went wrong. note: As a general rule, a puppy can hold the urge to eliminate for an hour of every month of his age. ie: A puppy that's 2 months old will need a potty break every 2 hours and so on, up until about 8 months old. Then your dog should be able to hold it for 8 hours at a time during a healthy adult life. 3. Use positive enforcements to encourage puppy to eliminate outside. When you take your puppy outside, encourage him to go potty and offer up verbal praises or a nice treat when he eliminates outside. Praise is the most effective way to show your dog you are pleased with him. Miniature Schnauzers in particular, respond quickly and favorably with positive training methods, so it isn't necessary to incorporate any type of disciplinary actions for bad behavior. Every time your Schnauzer does something right, flatter his ego with plenty of "What a Good Boy!" 4. Put your puppy on a schedule. Dogs like routine. So schedule potty breaks after meals, naps, play time, and so on. This teaches a puppy there will be certain times when he will be given the opportunity to have a potty break. When you have to leave your home for several hours at a time, or when you have chores to do where you cannot keep a watchful eye and supervise your puppy properly, the following housebreaking guide using the dog crate and paper will get you to your goal fast. Place the dog crate or your puppy's bed in the enclosed room so that your puppy is confined to this one area of your house only. Take 2 or 3 puppy pee pads and prepare them as follows: You will need the pee pads, newspaper, and double-stick tape. How to prepare the room: Place the pee pads away from the puppy's crate, bed, and feeding bowls. housebreaking tip: If possible, place one pee pad by the door that leads out to your puppy's designated potty spot. Now, take a few pieces of the double stick tape and secure the pee pads to the floor. Next place a few sheets of the newspaper on top of the pads. Since a puppy's natural instinct is not to mess in his own den, your Miniature Schnauzer will leave his crate/bed and wander to the pee pads to do his business. Upon your return, take your Miniature Schnauzer puppy outside, give the potty command, and praise him lavishly after he relieves himself. housebreaking tip: To encourage your dog to a designated potty spot outside, you can place a urine soaked pee pad outdoors. Since puppies like to re-urinate on top of lingering scents of urine, when you go to clean up the puppy room, only clean any actual on-the-floor accidents. In other words, leave the pee pads in place. What you want to do instead of removing the pee pads completely, is just remove the soiled newspapers on top and replace with new sheets of newspaper. This method leaves some of the urine scent behind that would have soaked through the paper onto the pee pads. The scent will encourage your puppy to eliminate on that spot again, and hey, you'll save some money on puppy pads! And don't worry, the pads' plastic waterproof lining will keep your floors clean, too. After a few days, replace the pee pads completely and start again. And that's it. Just keep at it. Be consistent and praise your Miniature Schnauzer puppy often. Supervise your Miniature Schnauzer puppy closely. Recognize the signs of pre-urination and get your puppy outside. Use the same potty command every time. 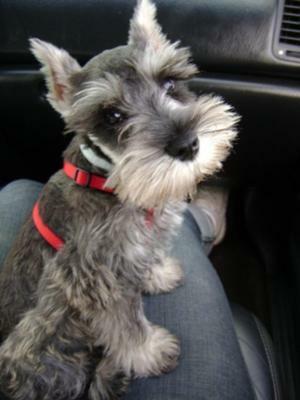 Praise your Miniature Schnauzer puppy ever time he relieves himself outside. Reprimand your Miniature Schnauzer only if he's "caught in the act". Use a stern NO and take him outside. Never reprimand your puppy after the fact. Be consistent with potty training. When away from home, leave your Miniature Schnauzer puppy in a confined area with access to pee pads. Take your puppy outside every few hours and as soon as possible after naps, meals or play sessions, to relieve himself. 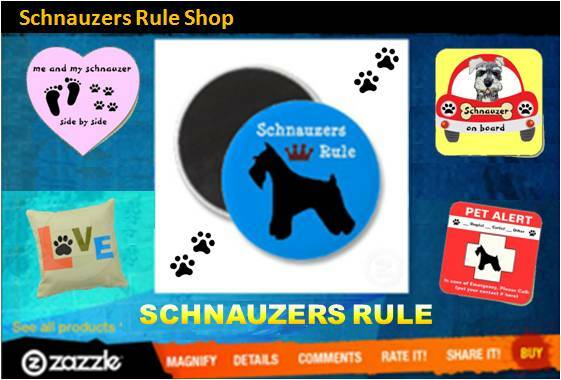 Get your Miniature Schnauzer on a regular feeding schedule. Always pick up food and water bowls at night. In a few weeks, once your Miniature Schnauzer's bladder is more developed, you will come home to nothing on the floor or on the pee pads and realize your Miniature Schnauzer puppy has held it all day! WooHoo! Always let your Miniature Schnauzer outside to his potty area, the very first thing upon your return home: a nice walk would be great! And be sure to praise him after every successful potty break. Your Miniature Schnauzer will soon associate the chosen potty word with going outside to relieve himself. House training puppy tip: Make sure everyone in your household uses the same potty command word. Remember, Consistency is Key! Even after your Miniature Schnauzer puppy is housebroken, continue to watch for the signals that he needs to go out (sniffing, circling, barking at the door, standing by the door, scratching at the door, etc). Or, you can incorporate the use of the bell system. Simply place a string of bells at the designated exit door for your puppy to nudge. This will alert you he needs to go out. It usually takes just a few days to get a puppy to realize that 'ringing the bells' will get you to the door to open it. Again, always use the potty command before you open the door and be consistent with your actions, too. (ie. always go to the door when your Miniature Schnauzer puppy rings the bell). The video below demonstrates how the poochie bell system works. It's bound to happen, your puppy has a potty accident. Don't over react. If you get angry, you will only slow the learning process. Your puppy may begin to fear you or just learn to hide a potty accident. What you want to do instead, is clean the mess up right away with a pet odor neutralizer to eliminate any traces of the scent. note: Do Not use ammonia cleaners to clean up pet stains. Ammonia breaks down to urea, which is a component of urine. *See our Home Recipe for Removing Dog Urine Stains. Simply continue with your potty training and the accidents will be rare until they are no more! Soon, your Miniature Schnauzer puppy will come to view the whole house (and not just his dog crate) as his home and therefore will not relieve himself anywhere indoors. Good Luck with whatever housebreaking method you choose for potty training your Miniature Schnauzer. And don't forget, I want to hear from you! So write and let me know about your puppy's housebreaking experience. "Knowledge Share"... If you found this page on housebreaking a puppy helpful and informative, please share it with your dog-loving friends by clicking on one of the share links (like facebook, twitter, and google +1) located at the top right or bottom of this page.